Guests can relax on spa beds at SiSpa before or after their treatments. Located on Florida’s Singer Island, Palm Beach Marriott Singer Island Beach Resort & Spa is an oceanfront resort that offers a variety of deluxe amenities accompanied by intracoastal and ocean views. It is also home to SiSpa, a luxury day spa that combines modern technology with ancient arts in a fresh approach to well-being. Why You’ll Love It: Our guests love that a service at SiSpa provides them with access to our beautiful resort, its private white sand beach, and pools. Our approach to natural wellness is also a major draw. The spa’s reception desk and retail area. 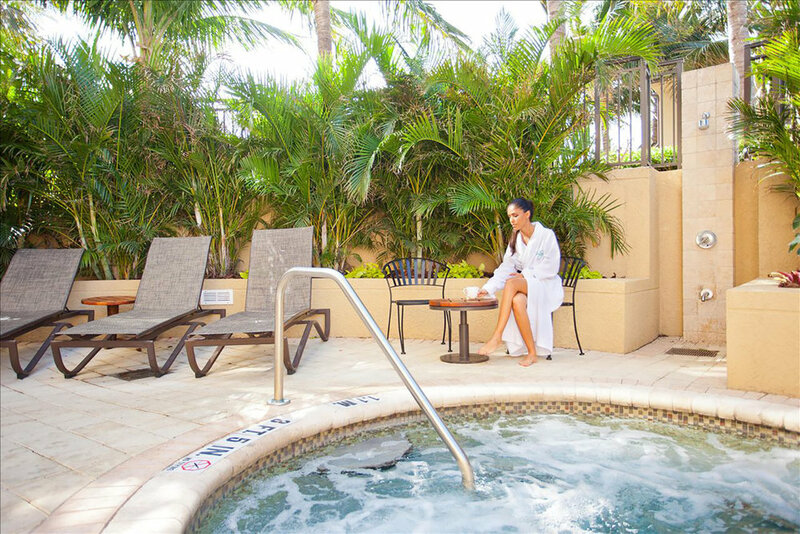 Key Features: SiSpa at Palm Beach Marriott Singer Island Beach Resort & Spa is an award-winning seaside sanctuary, offering world-class wellness and pampering inspired by the natural beauty and healing powers of the ocean. The world’s oceans and seas lend their names to each of the treatment rooms at SiSpa, while their restorative elements are harnessed in therapies ranging from a Voyage of the Si to a Replenishing Sargasso Seaweed Experience. The spa also has separate manicure and pedicure areas. Snacks Served: Fruit and fruit-infused water, mimosas and champagne. We also offer a spa-cocktail menu that includes three cocktail options: Renew, Radiant, and Refresh. Insider Tip: SiSpa’s entire spa staff is trained in spa treatments for guests with cancer, including treatment framework and procedures. We offer a “Comfort Care Classics” menu with a selection of services specifically designed for guests being treated for or recovering from cancer. The menu offers massage, facial, body, and nail services that promote relaxation and stress-relief to oncology and recovering guests. A special 20% discount on all regular-priced services is offered to a caregiver who might accompany a “Comfort Care Classics” guest to the spa. SiSpa is the only spa in Palm Beach County trained in these specialized services. A relaxing tub in one of the spa’s treatment rooms. Bonus: With the world’s third largest barrier reef just offshore, Marriott Singer Island is an eco-adventure destination in itself. Besides energy-saving measures on property (like power- and water-conserving appliances in suites and a water- and energy-saving linens program) the resort has focused its attention on protecting Florida’s turtle population. At SiSpa ,we’ve implemented a“For the Love of the Si Turtles” program, donating 10% of sales from a 50-minute Signature Massage or Signature Facial to the Loggerhead Marine Life Center. Unique Treatment: Our signature treatment is the Indian Si Scrub. Utilizing regional and natural products from Florida Salt Scrubs, such as grapefruit, sea salt, and coconut oil, this 50-minute treatment begins with an invigorating full-body scrub, followed by a massage with a grapefruit and coconut oil application. Grapefruit is packed with essential vitamins and antioxidants, and contains the richest source of natural vitamin C. This treatment helps tonicity, elasticity, and improves skin texture. Splurge Treatment: Our multi-service packages are definitely splurge-worthy. 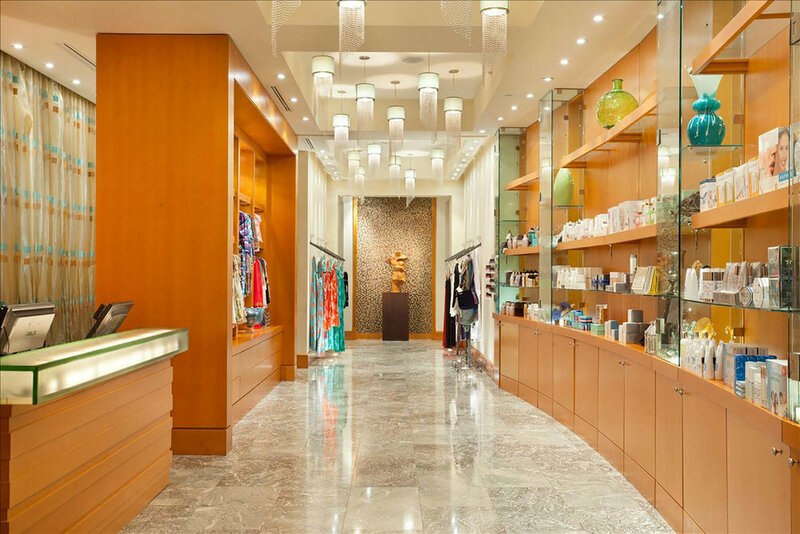 The Ultimate Experience of Si experience is 4.5 hours and includes an 80-minute Si Signature Massage, 50-minute Get-Up and Glow Resurfacing Facial, and a Singer Island Signature Manicure and Pedicure. Insider’s Favorite: The Indian Si Scrub (mentioned above). Couples can also enjoy massages together in the couples’ suite. Featured Products: Florida Salt Scrub, HydraFacial, Intraceuticals, Jurlique, Phytomer, Pure Fiji, and Skin Authority.